Allison Conway is an illustrator and cartoonist living in Brooklyn, NY. She graduated from the Savannah College of Art and Design with a BFA in Illustration in 2016. She has worked with clients like The New York Times, The Wall Street Journal, The Boston Globe, and Yale University, and for over two years has published a comic strip in Vice about a pillbug named Millie. She grew up in the woods of Lake Geneva, WI and has always had a passion for animals and living organisms of all sizes. 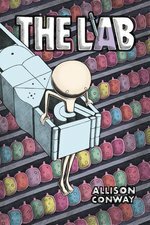 The Lab is her first graphic novel.